Since February 2007 Monocle magazine has served it's readers with some of the best briefings on international affairs, budiness, culture and design. It seems only natural that they should expand into the realms of providing locations in which to read their thick, book like issues. This new, London branch of the Monocle experience is in Marylebone, just a few shorts minutes from bustling Oxford Street but a complete world away. The streets are quiet and the cafe's outdoor seating will give you plenty of opportunity to watch the world go by. Or on a weekend afternoon much more likely you'll be watching the world sit still. 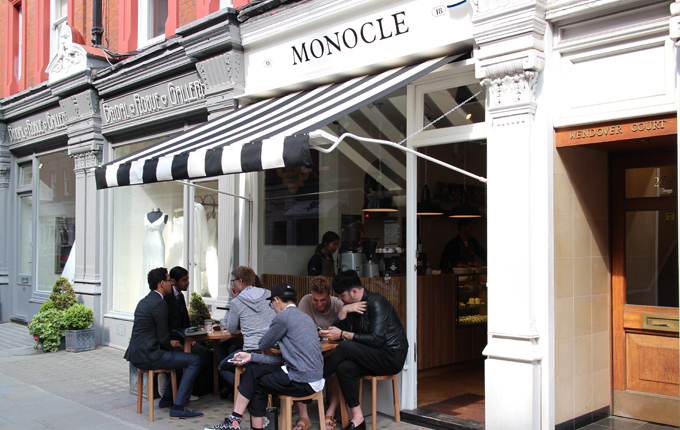 The Monocle Cafe in London is the brand's second cafe with the brands first location being in Tokyo, Japan. The Monocle Cafe might not be everyones cup fo tea, or coffee, but seasoned Monocle followers will be sure to feel at home within the cafe's 'Monocle' aesthetic, and will be able to benefit from being able to get a coffee, a copy of Monocle and a seat for a very reasonable £6.00. And if you just can't get enough of Monocle their London store's are just down the road on George Street and just round the corner inside the Hyatt Regency London.